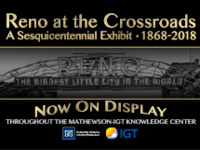 Reno at the Crossroads is on display throughout the Mathewson-IGT Knowledge Center. The exhibit explores Reno's colorful evolution from its founding in 1868 to the present through photographs, maps, documents, mass media, and more. Interwoven throughout are firsthand stories from the men and women who have made the Biggest Little City in the World a crossroads of people and ideas for generations. Learn more about the exhibit by reading the NSights blog.